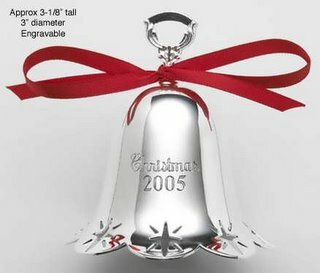 Funny timing -- I heard bells on a porch today, recorded bells on the radio, and those Salvation Army bells at the store. I certainly didn't see any angels -- but I did just post about angels last night. Coincidence? Maybe God updated technology too? I hear a bell every 50 minutes during the day. Every time a buzzer sounds an angel gets annoyed. What an interesting observation! I am going to listen for bells. Honestly? I'm glad for the lack bells. They wrack my nerves! I miss that freaking movie with Michael Landon! I cried SO many times. My mind is shot as of the late, what was it called? I Was A Teenage Werewolf? You have a thing for the hairy guys, Jenn? Since I first read this I've been paying attention to bells. You're right, there aren't a lot of them out there anymore. Yesterday someone was carrying sleigh bells up the stairs in the office building, I forgot how much I like that sound.